We manufacture the solution for the tens of thousands of properties with poor noise reduction through ceilings that allow too much noise to be transmitted from the floor above. Introducing the Oscar Iso-Mount range! A rigid structure of floorboards joists and ceiling boards all screwed together transmits noise as vibration between floors. Packing an absorptive material in the voids between joists will give some benefit but a true noise reduction ceiling really works by isolating itself so it is not connected rigidly to the floor above: the path of vibration and therefore noise is broken. Prior to the current Building Regulations 2010 Approved Document E, ‘Resistance to the passage of sound’ the issue of noise reduction through floors and ceilings did not have such high priority. The principle of achieving high noise reduction by isolating ceilings from floors to prevent noise transfer by vibration is well proven and due to the 'Approved Document E of the Building Regulations 2010,' it is now widely practiced in construction. 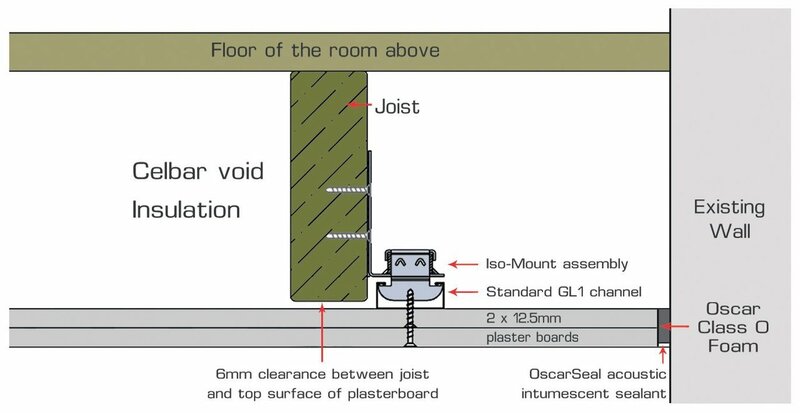 Oscar Iso-Mount noise reduction ceiling mounts (available to buy in our on-line shop), isolate the ceiling boards from the joists, thereby drastically reducing the amount of noise generated vibration that is transferred from the floor above. The vibration energy dissipates within the Oscar Iso-Mount. This principle of isolation is fundamental to the success of noise reduction ceilings and floors. Oscar Iso-Mounts are fixed to the sides of the timber joists therefore they can be fixed high, achieving the absolute minimum of just a few millimetres in ceiling height loss but enough to prevent noise transmitting through the floor/ceiling as vibration. The Iso-Mount noise reduction ceiling is all installed from the room below so there is no need to enter the premises above. Independent acoustic tests of actual ‘on site’ installations demonstrate that the recently introduced and stringent Building Regulations Part E have been easily exceeded without the need to lay noise reduction treatments on or under the floor above. We studied the shortfalls of systems already available and designed and produced a more effective product for installation by builders and competent DIY people with excellent results. Loss of ceiling height because the isolating framing runs under the joists at right angles. Noise reduction isolation also being necessary under or over the floor above which leads to room height loss in the room above as well. Boxley Road: conversion of a house to flats. Wilberforce Road: reduction of noise between first floor bedrooms and ground floor dining room and lounge in a private house. Absolute minimal loss of ceiling height – just enough to allow clearance between the ceiling boards and the joists. The design must incorporate the, ‘floating ceiling’ principle in order to achieve best noise reduction: i.e. a noise reducing ceiling that is rigid but mechanically isolated from the building structure to prevent transmission of noise by vibration. All work to the noise reduction ceiling must be able to be carried out from the room below, i.e. no work to be necessary to the floor of the room above. The installation of the noise reduction ceiling to be within the capability of a competent DIY person. The design must have built in tolerance to allow for reasonable inaccuracy by the noise reduction ceiling installer. Independent acoustic testing to be carried out by a qualified acoustician on at least two Iso-Mount noise reduction ceiling installations in inhabited domestic properties. Test results must comfortably meet the requirements of Approved Document E of the UK building regulations 2010.